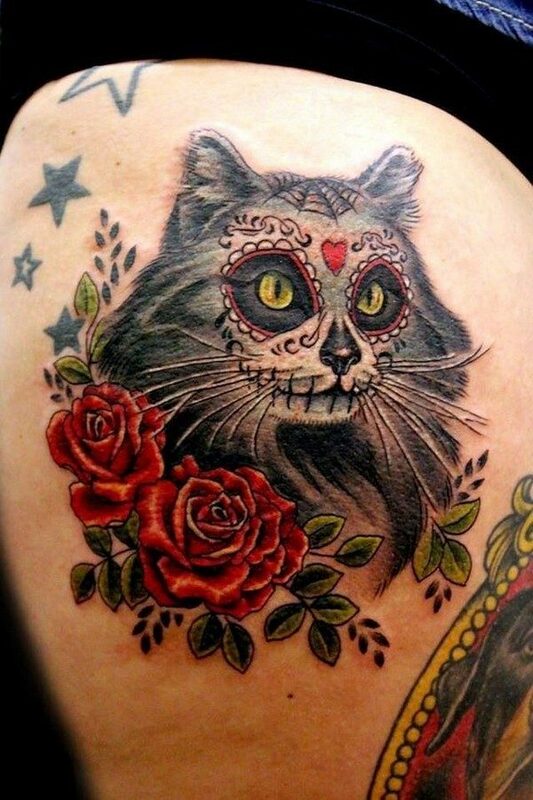 Tattoos are a form of body art, which describe one’s attitude and personality to the best. 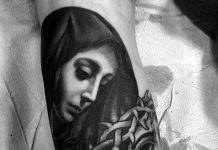 For this purpose, it is important to choose a tattoo design with care, as tattoos are permanent in nature and there is time, money and physical pain involved in having a tattoo done on your body. 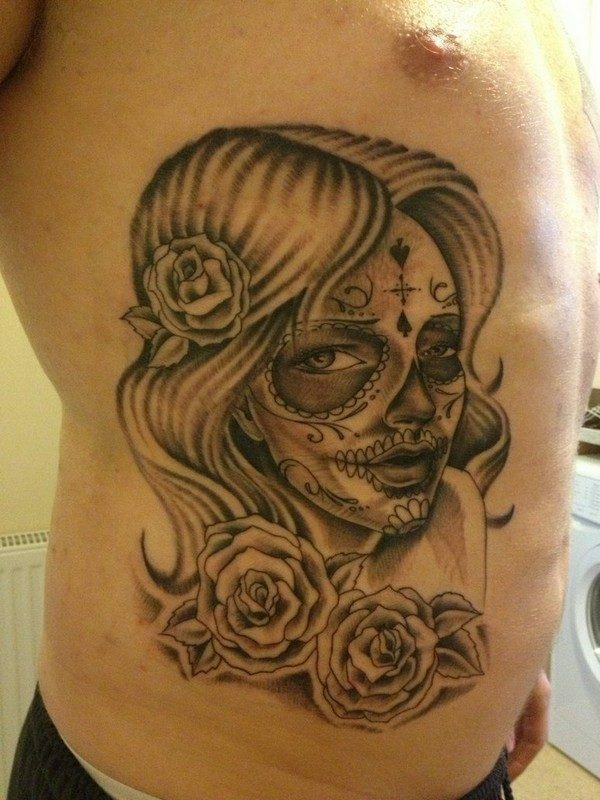 There is a great variety available in tattoo designs for men and women, with skull tattoos being one of the most popular options for youngsters looking to get themselves inked. 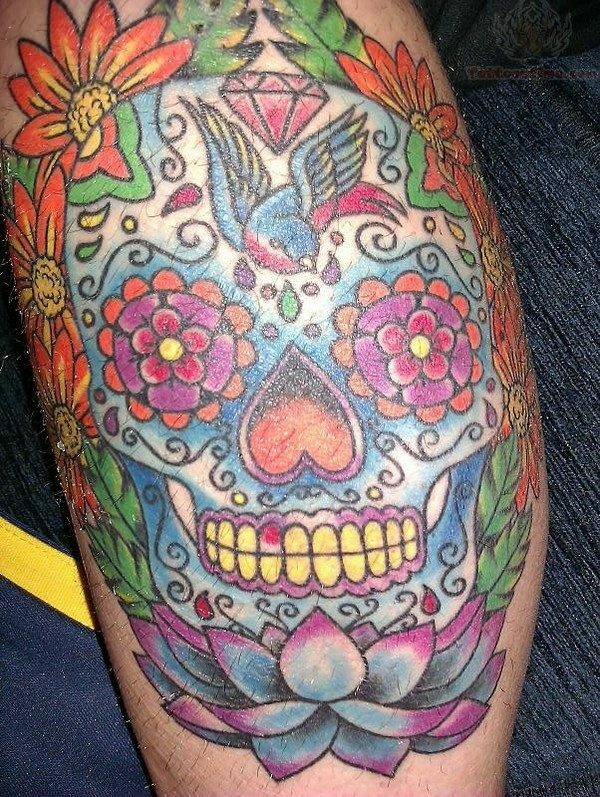 In fact, skulls are something which will strike your mind at the first thought of tattoos. Such tattoos are meant for the bad, the rebellious and the ones who want to flaunt their attitude. But these are a versatile lot, with a look which can be changed by simply incorporating some additional design elements, which can make the basic design look scary or even cute. 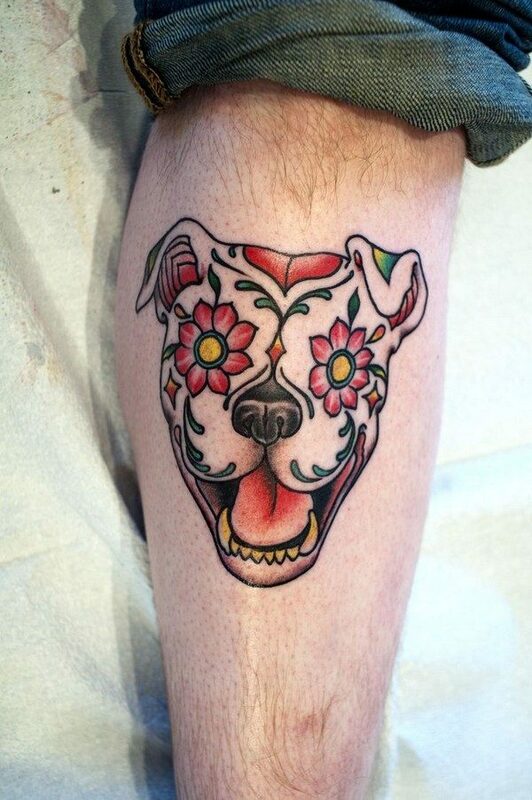 They are becoming extremely famous body adornments on a lot of men and women tattoo lovers all over the globe. These have been the common choices of many in the past years and even up to these days. Even so, it seems that the public has a bad impression with these tattoos. There are some people who see these tattoos as bad symbols in the society. The big question is,did you know that the skull is not just representing negative things? Yes, these tattoos are also symbols of a number of great things that you should know. Temporariness–The skull image is simply saying that every life in this world is just a temporary one. This is the main reason why you should give value to your life, and make the most out of it. Intelligence –Just in case you do not know, intelligence is one thing this tattoo is representing. There are so many cultures that are believing that a skull is an elite symbol that is symbolizing the higher consciousness of a person that makes her or him very intelligent. Power – It is also symbolizing power and strength. It is simply because there are lots of people who are afraid of human skulls. Meaning to say, only those brave people can wear a skull art. In case you are one of those who are very brave, then wearing them is definitely perfect for you. Beauty – Who would expect that it also means beauty? You surely don’t believe it, do you? But it is true, for sure. This will just depend on the kind of design that you are choosing. 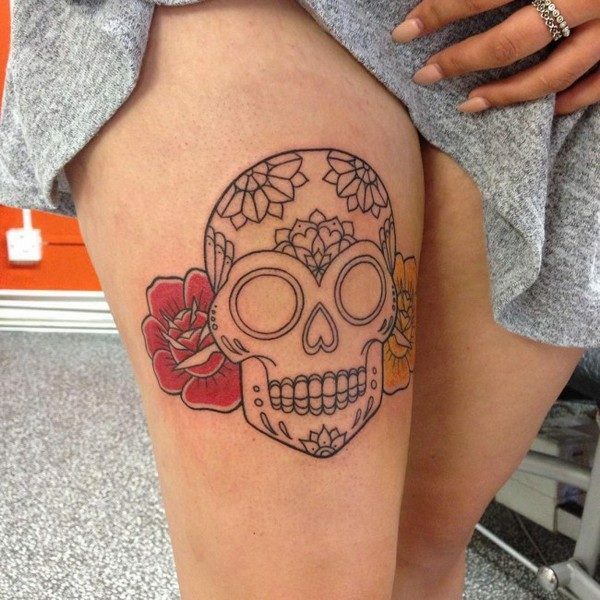 To achieve this symbolism, you should have a very girly design like adding some ribbons and flowers to the image of the skull. This is the main reason why there are also a lot of women tattoo lovers who are choosing them to be engraved on their body. Death –Well, this is a very obvious symbolism, right? A dead person will eventually become a skeleton that involves a skull. It is just reminding the entire human race that everyone will die in due time. Meaning to say, death is an inescapable thing to anyone. 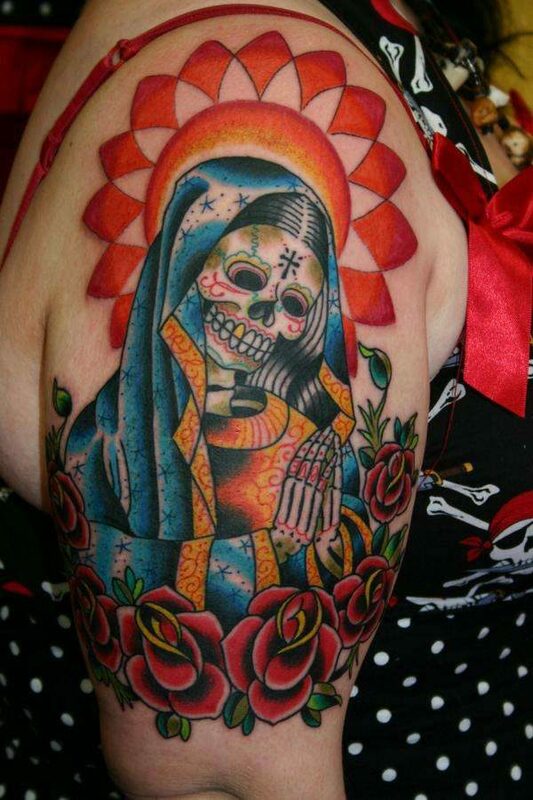 And if you believe on the nature of death, wearing a skull art tattoo would confirm it. Intimidation –It is just normal for us to meet some people whom we get intimidated with, especially when we are trying to approach them. If you want to warn the people surrounding you that you can be an intimidating person when you get mad, then wearing a skull art tattoo would definitely great for you. There will surely no one who will try to make a mess with you. What do you think about that? Fearlessness –Another thing that they are representing is fearlessness. In other words, it will tell the world that you, as a wearer of a skull art tattoo, are a fearless kind of a person. With that being said, the people around you will definitely try their best not to make you mad. This is one great reason why youngsters of this particular generation are choosing them. For sure, you have noticed that many of the youth these days are very fearless. 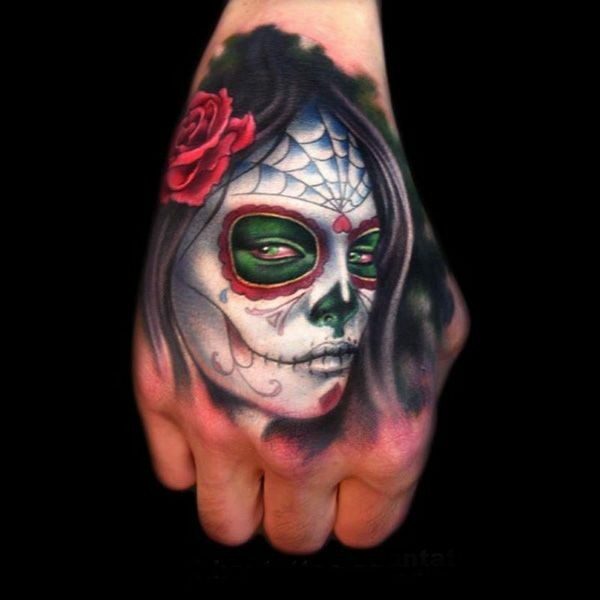 Protection –Believe it or not, there are so many people in the world who believe that a skull art tattoo is something that can protect them. Some of these people are those fearless bikers. They believe that they can be well protected while driving on the roadways if they have such tattoo. Some of them are even wearing things that are being associated with human skulls like shirts, necklaces and the like. Many global celebrities have been seen flaunting different types of skull designs, which is what makes these designs so cool and desirable among young men and women. Some of the notable stars who are seen with skull art are Ben Affleck, Rihanna, Chris Brown, Jon Bon Jovi, Slash, Allen Iverson, Kelly Osbourne, Nick Cave, Nicholas Cage and Mickey Rourke. 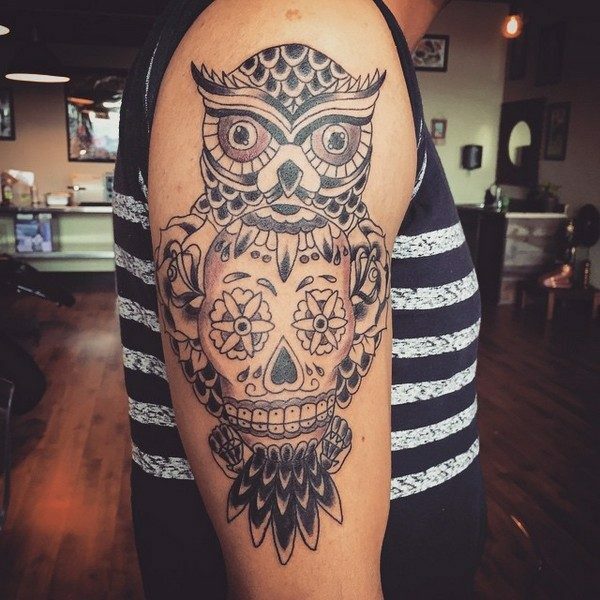 All these people have contributed to a great extent to the popularity of skull tattoos by showing off these designs in public. 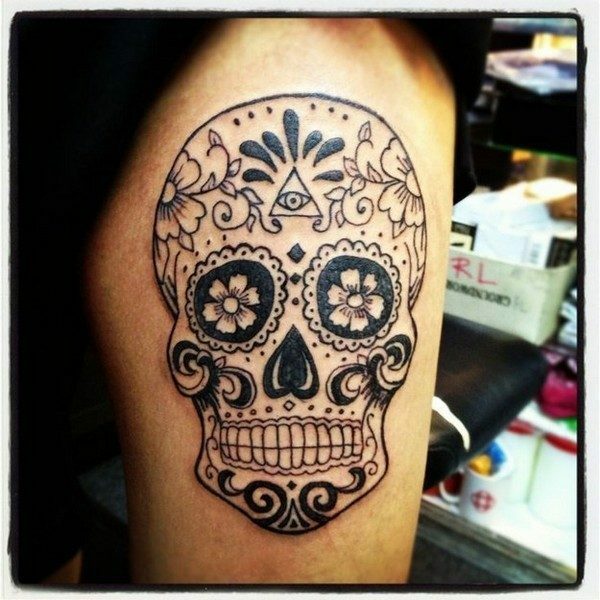 Sugar Skull Design–A sugar skull design is very popular among Mexican people. A lot of them are wearing this design. They strongly believe that this is one great way of acknowledging those dead people who are no longer existing with them. It is called sugar skull simply because it is made from a clay-molded sugar that is being incorporated with some other decorations such as beads and flowers. Men and women can definitely wear this design. Gothic Skull Design –This design is the common choice of those fearless people. It is simply because the entire design would definitely look very scary, and not that nice to look at among other people. It is mainly made of a human skull that is drawn in a bit scary way. It is very rare for you to see a Gothic skull design that is incorporated with some other sub designs. But if you want to add some more designs, you can definitely do so. You just need to tell your hired tattoo artist. 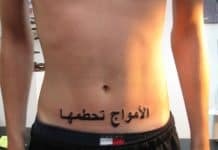 You are the one who will be wearing such tattoo on your body, after all. 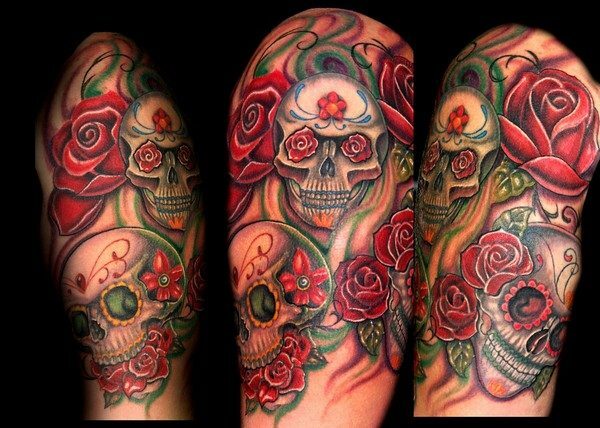 Rose and Skull Design –Well, it is very obvious that this particular skull design is made up of an image of a rose and a human skull. It is a very interesting design since it will combine the good and the bad feeling. 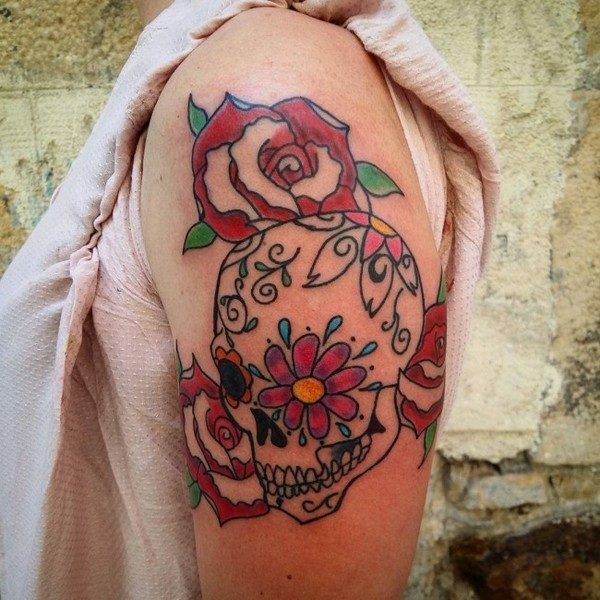 The human skull which is the bad, and the rose symbolizing the good. Isn’t that very interesting for you? This design is actually reminding the entire human race about beauty and decay. 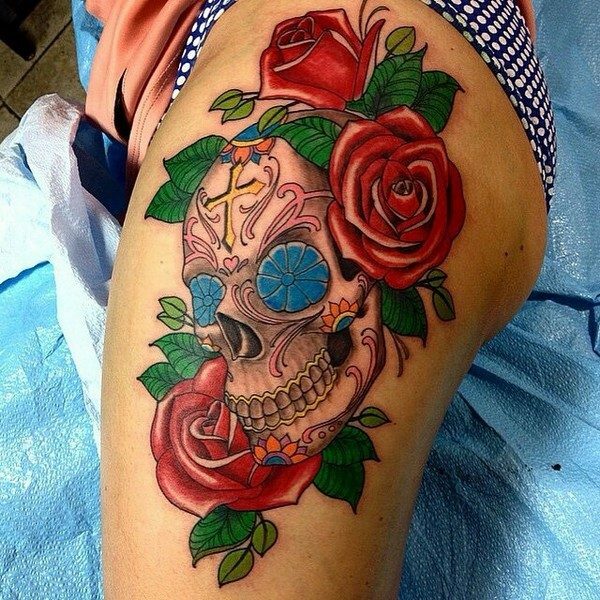 Girly Skull Design –Who would say that a skull art tattoo is only for men because of its masculine appeal? Well, that is only a thing in the past. There are already a number of women nowadays who are wearing them. 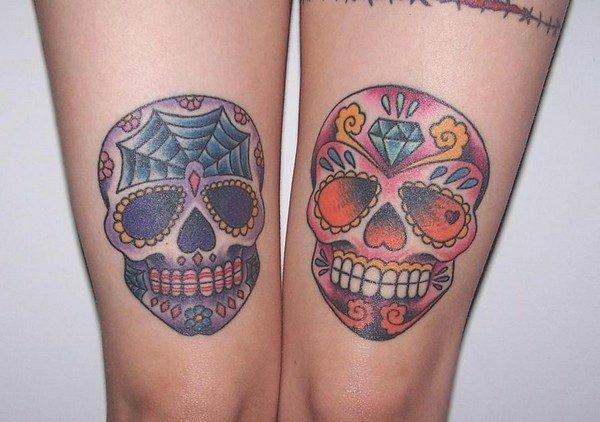 It is all thanks to those professional tattoo artists in the world who keep on inventing a number of gorgeous designs that will also look great on women just like the girly skull design. As its name suggests, this will look so girl because of the numerous designs being incorporated like flowers, ribbons and the like. The skull may even become girly by making its eyes a heart-shaped one. Christian Skull Design–Just in case you do not know, a skull art is being associated to a lot of cultures and religions. Christianism is one good example of them. This is the main reason why a Christian skull design has been existing. Of course, this is a very common design that is opted by a lot of Christians in the world. Even so, this does not mean that you cannot have it if you are not a Christian. You can still have it, but make sure that it relates to some other important things to you, and not for your religion. 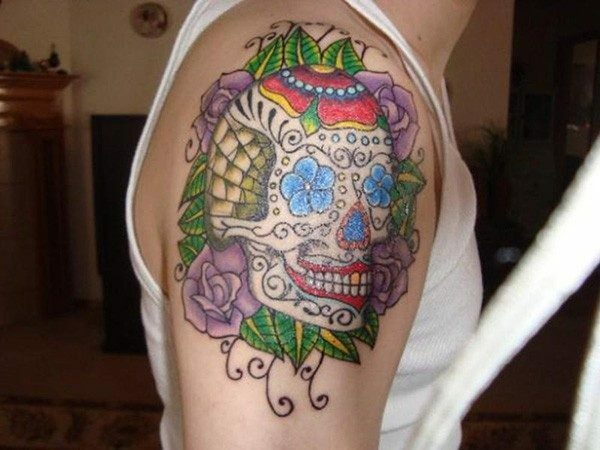 Tribal Skull Design –One other very common yet beautiful skull design is the tribal one. This is the ultimate choice of many people, and you are certainly aware of it for sure. There is no question about that since this design will really look great and artsy when engraved on your body. Skulls are usually looked upon as scary and threatening objects, but the fact is that they can be adapted in different ways to depict different meanings. For instance, a sultry skull done in black or grey can be frightening and masculine to look at, oozing pure power and strength. 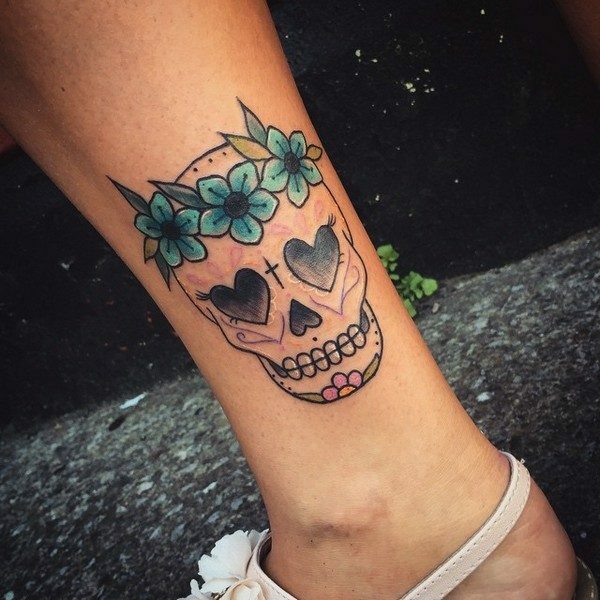 On the other hand, a skull done in a soft and delicate color with the eyes depicted by hearts can look absolutely cute and girly. 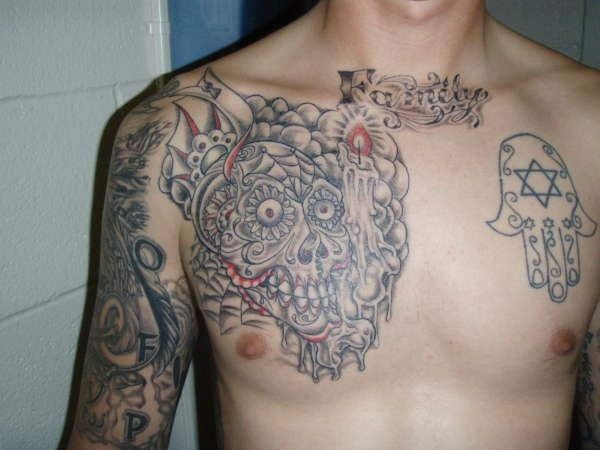 In some cultures, skull art tattoos have been related with gangs and prison, while they have been used as a talisman for bikers to protect them from the dangers of death. In fact, skull stands for death and mortality, reinstating the fact that man is mortal and he is going to die one day. In some cases, it also signifies life after death. 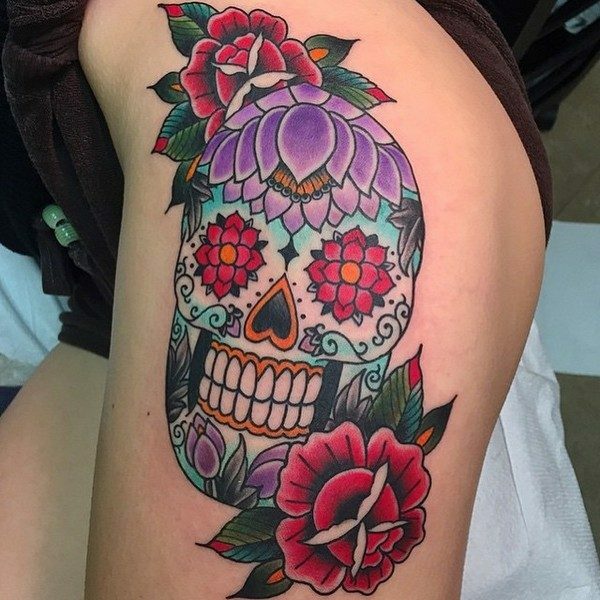 In modern context, youngsters associate skull art tattoos with being cool, which is why they love this tattoo design so much and it is very popular among the youth, both boys and girls. It shows sheer power and fearlessness, besides ability to face any kind of danger, which is quite an enhancement for a youngster’s personality. Would you like to check our hand-picked collection of top 100 Maori Tattoos? Jessica White–Jessica White is a 32-year-old American model who is a great fan of a skull art. She has this tattoo on her left wrist that is also being associated with one sub design, which is a cross-shaped dagger. Fantasia Barrino–Fantasia Barrino became a celebrity after winning the American Idol. 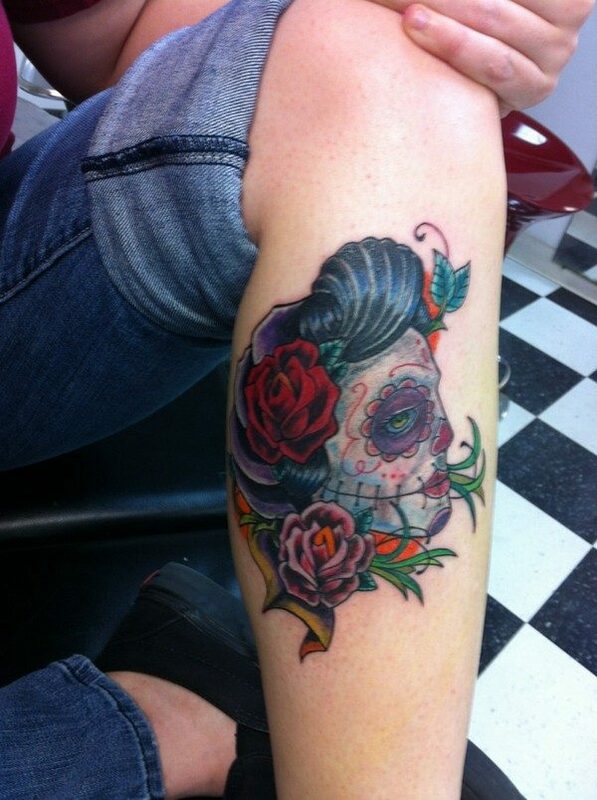 She has a very gorgeous skull art tattoo that is engraved on her left arm. 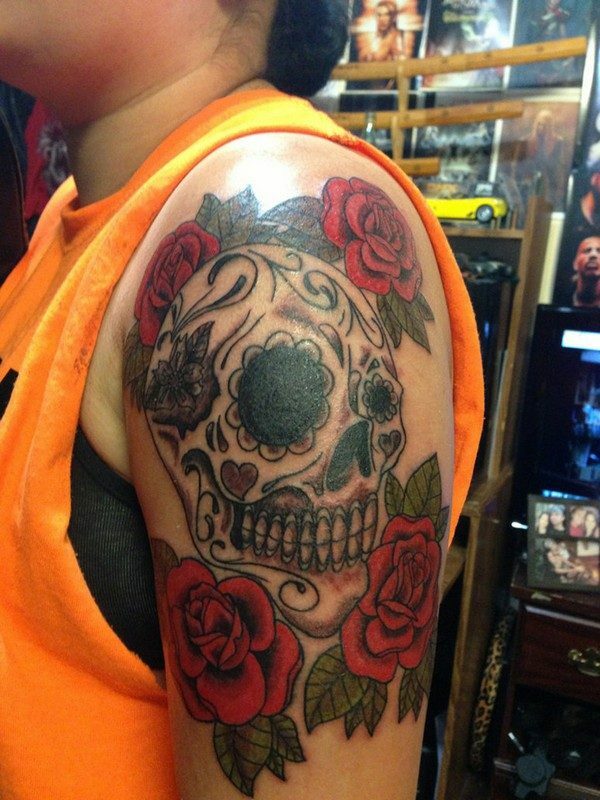 Jesy Nelson –Last January 2014, Jesy Nelson get tattooed with a skull art that is incorporated with a rose design that is located on her left arm. Just in case you do know, the placement will also matter to achieve its greatness. Even so, it is all up to you where you wish to put it. But of course, it would be great to think about its placement many times before getting a tattoo. 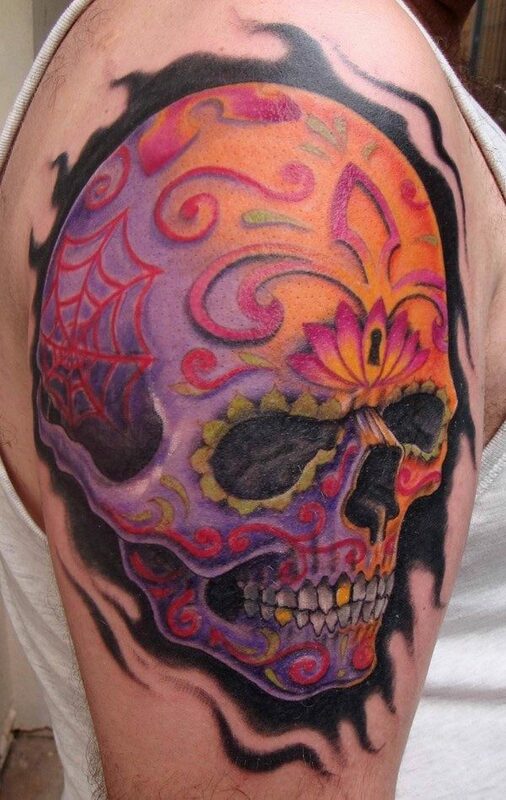 Skull art tattoos can be placed on several parts of the body. Mostly men prefer mostly having these tattoos on their sleeves. That is the upper part of the arm. Other places include the back, the thigh (ladies), the chest (men) and a few people place them on neck, foot, hip, stomach and legs. Skull Love Design – The love design is one of the most popular designs for both men and women, which has a skull incorporated with two crossbones and red hearts in place of eyes, to show the adventurous nature of love. Flower Skull Design – Another cool optio is the floral design, which showcases the skull with crossbones and flowers, done in an array of vibrant colors and soft patterns for a brilliant effect. It can be done in a feminine or masculine design according to the taste and requirement of the bearer. 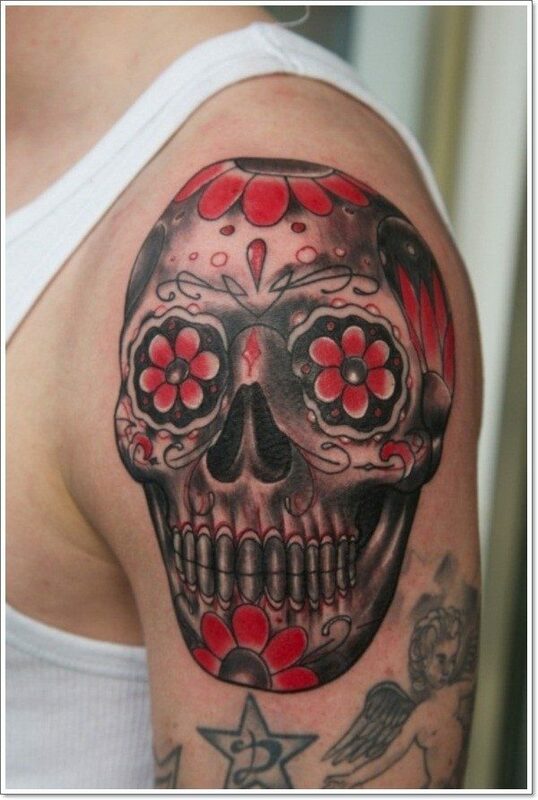 Roses, lotus and cherry blossoms are the flowers commonly used in floral skull pattern. Tribal Skull Art – The tribal skull art, which is done in black and features bold strokes and lines, remains an eternal favorite among the skull designs. 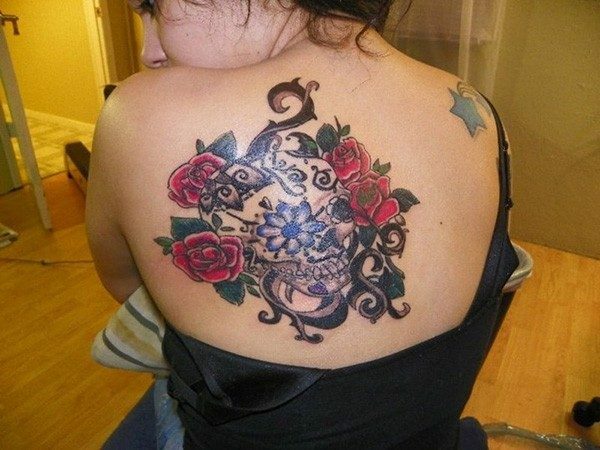 This design is mostly favored by men and looks best when done on arms, chest, wrist, shoulders, thigh and back. It is a strong looking design which showcases raw power and bravery. Morbid Skull Art – The morbid skull design is done with a 3D technique and looks absolutely scary. It represents confidence and strength of the bearer. Similarly, a smashed skull design can signify the end of the old and the beginning of the new. 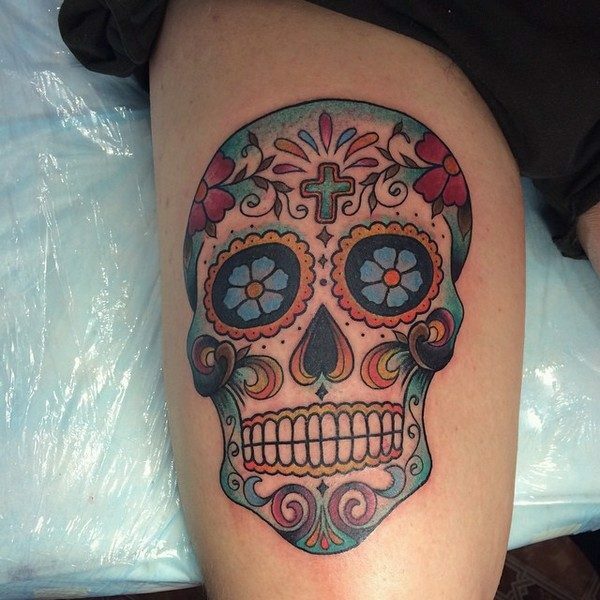 Sugar Skull Art Tattoo – Sugar skulls are a part of Mexican culture and make a commonly featured these days. Skull is an important part of the traditional Mexican celebration called The Day of the Dead, which is carried out on 2nd November every year. On this day, a gathering of family and friends is held in memory of the loved ones and edible sugar skulls are made. 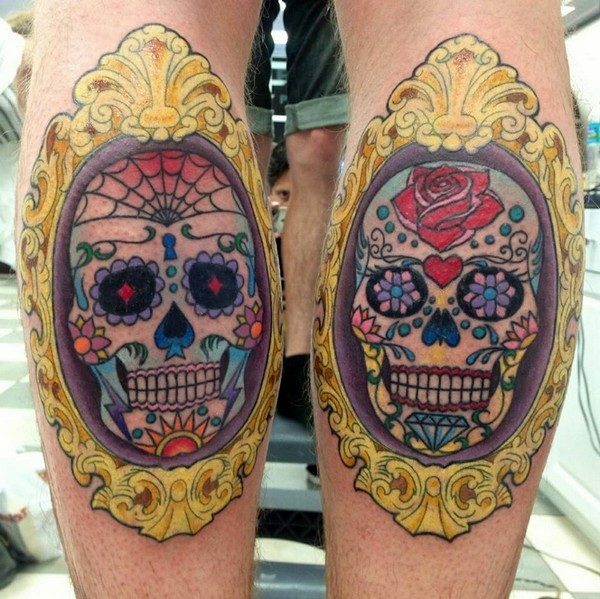 These skulls are decorated with flowers and ornate designs. 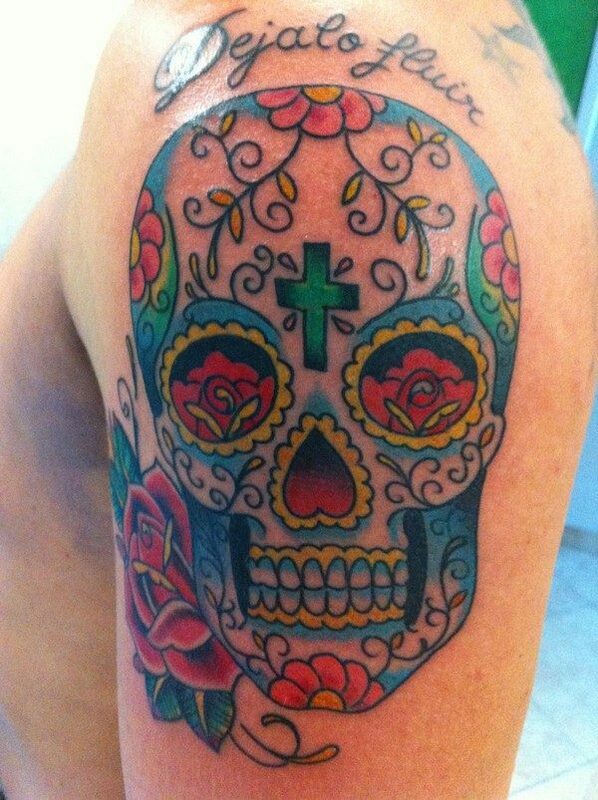 A sugar skull is also used as a design element, as a token of honor for a loved one who has died. The tattoo mourns the departed soul, and at the same time celebrates life as it goes on after he has left. Skull and Crossbones Tattoo – The most common design is the skull and crossbones design, which was originally used by pirates in old days. It is also a symbol of danger and poison. The tattoo may also include a Confederate flag, complete with stars and bars. Grim Reaper Tattoo – One of the most menacing looking design is the Grim Reaper tattoo, which features a hooded skeleton with a scythe, which it uses to harvest the souls. The scythe may be replaced with a funnier object like a guitar to add a sense of humor to the tattoo design. The Grim Reaper symbolizes death. Bull and Deer Skull Art – Another well liked skull design is the one which uses animal skull rather than the human skull, the main ones being the bull and the deer. The bull skull design shows prominent looking horns and is meant to show the attitude of people who do what they love to do. On the other hand, the deer skull design may or may not show the antlers on the basis of the choice of the bearer of the tattoo. 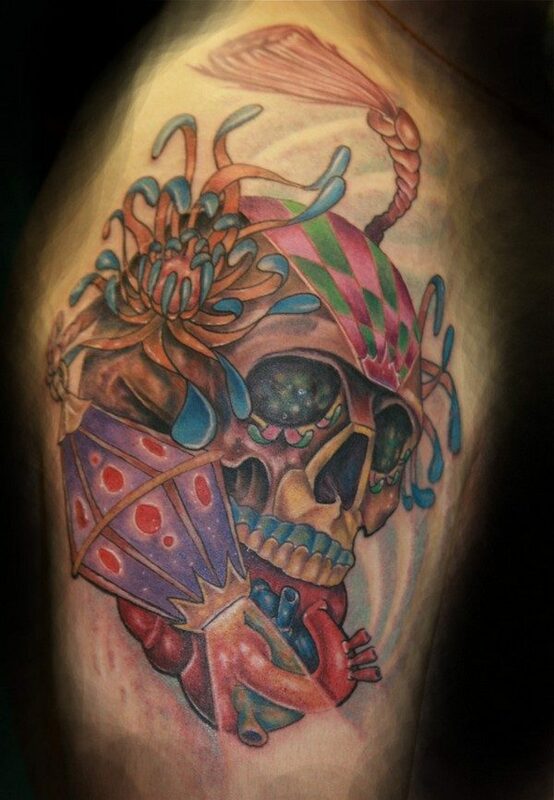 Some other skull art tattoos may feature skull with other objects like flame, birds (like phoenix, humming bird), butterflies, feathers, anchors, dreamcatcher, dagger, angels, wings and stars. One can note the aesthetic value as well as symbolic meaning of these tattoos before having them inked. 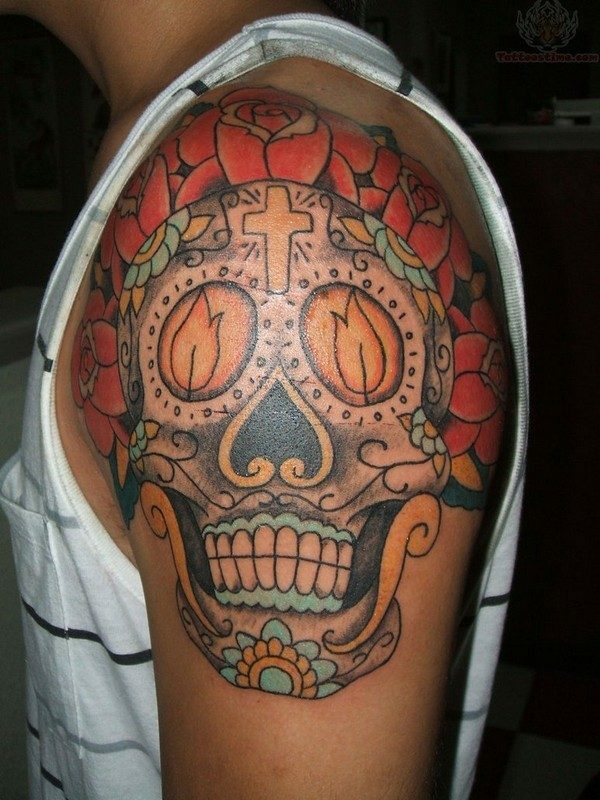 The choice in skull art tattoo designs, is so wide that it can be quite confusing to pick the right one. 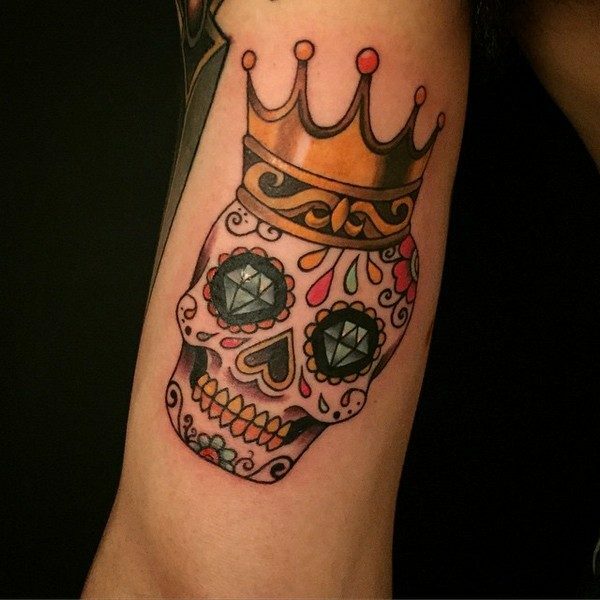 A bit of research can be of great help in making the correct choice among the various options available in skull designs, as these tattoos are going to be a part of you always. 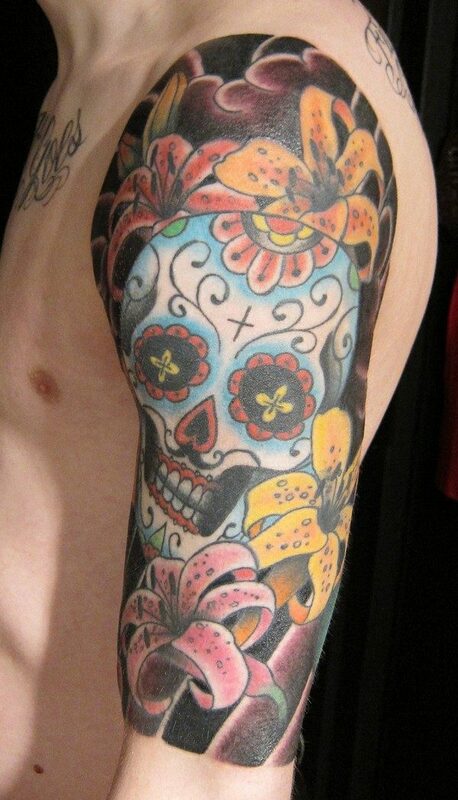 There is no question about the fact that skull tattoos are great adornments on anyone’s body. One thing about it is it is very symbolic and meaningful. You can have a lot of choices when it comes to a skull art. You just have to know what is the design that suits you best.